PEAK RAZA is a highly efficient nitrogen fixing bactenal formulation. It can fix 50 -100 kg nitrogen per hectare in one crop season and leaves a substantial amount of nitrogen in the soil for succeeding crops. Application of 1 litre of PEAK RAZA is equal to application of 100 kg urea. 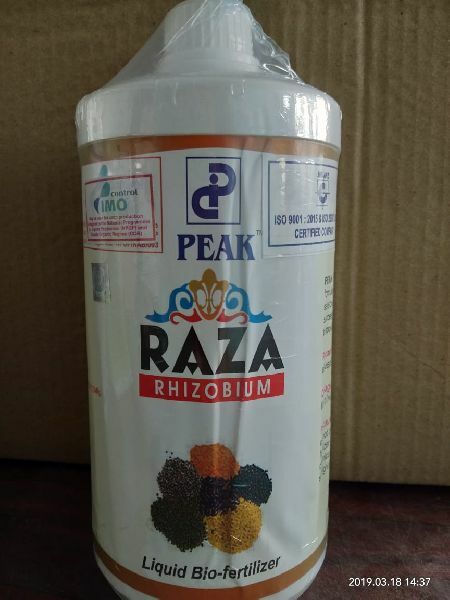 Recommended for : PEAK RAZA can be used on pulses and oilseeds. Dosage & Applications (Acre) : Mix 100 ml of the product in 200 litre of water. Use as basal or soil application. Precautions : Chemical fertilizer, fungicide and pesticide cannot be mixed with the bio-fertilizer. However, usage of bio-fertilizer shall be strictly after 10 days from the date of use of chemical fertilizers, pesticides. Keep the product away from sunlight and high moisture.